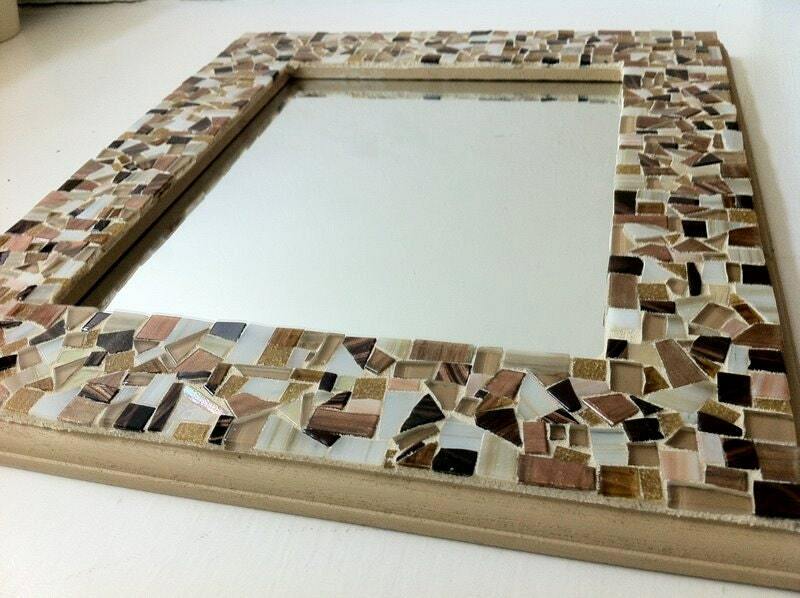 This mosaic mirror features beautiful browns, golds, whites, and tans. All tiles were individually cut by hand and arranged randomly. There are seven different colored tiles - some vitreous, some glass, some iridescent. The white tiles have swirls of gold and brown, the brown tiles swirls of dark rich chocolate brown. I also included several shades of tan, gold, and lighter brown. The many colors blend together beautifully by complementing each other and creating an appealing color scheme. Since the tiles reflect the light, this mosaic mirror will brighten up any room. The sides and back are painted in light brown. There are cutouts on the back for easy hanging! This mirror can be hung or displayed either horizontally or vertically. This mosaic mirror measures 12 x 14 inches overall. The mirror measures 9 1/2 x 7 1/2 inches - a perfect size for an entryway or hallway.